HUNTERSVILLE, N.C. (BUSINESS WIRE) – Rubbermaid Healthcare, the premier provider of mobile and wall-mounted workstations, today announced the release of CareLink, a new mobile nurse station that enables caregivers to more actively engage with patients and save time, without compromising the quality of care. 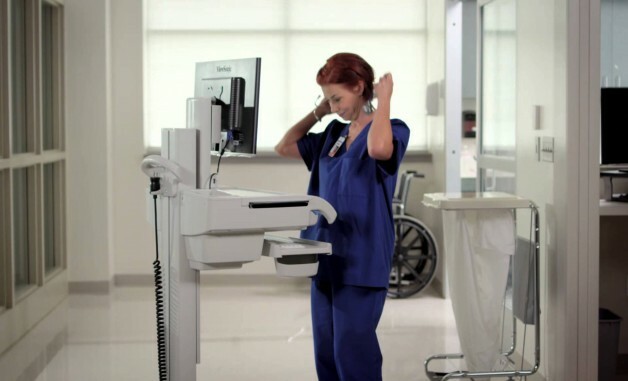 Featuring an intelligent software platform, the new workstation incorporates a seven-inch integrated LCD touchscreen that allows for messaging capabilities, customized user settings, and interactive tools designed to streamline care delivery and reduce distractions to nursing workflow. A communication system that allows clinicians to send and receive messages from other areas, including IT, pharmacy and housekeeping, directly on the touch screen computer, increasing response times and minimizing disruption to patient care. Customizable memory settings for each cart user. Memory settings are transferable to all carts in the fleet for seated and standing positions, display brightness, and alarm volume. Built-in tools, including an on-screen calculator and a detailed battery life display that indicates “time remaining” and “time to charge” information. On-board user tutorials improve ease-of-use and minimize the need for additional mobile devices. The new mobile nurse station, along with the rest of Rubbermaid Healthcare’s product line, will be available for demonstration this week during the 2013 Healthcare Information and Management Systems Society (HIMSS) Annual Conference in New Orleans at Booth 3153. For more information, visit www.rubbermaidhealthcare.com. Rubbermaid Healthcare is the premier provider of medication carts, wall-mounted workstations, mobile computing solutions and telemedicine carts for healthcare facilities striving to enhance patient care, safety and staff productivity. Product development focuses on providing caregiver workflow advantages and improving the integration and acceptance of technology into the patient care process. Rubbermaid Healthcare (www.rubbermaidhealthcare.com) is part of Newell Rubbermaid’s global portfolio of leading brands.